yup, thatsa Fx fer sure ! I am beginning to see a pattern here. Is this a 2tone or just ss model?? I'll stick with the cheap folded one, thanks. SS m serial, less than 12 months old and not a solid daily wearer. Sorry to see this again. Can you provide us your clasp code also? those welds seem to be a weak point. Remember when we all voted on a poll as to welded vs machined? Remember when just about everyone voted machined? Did Rolex listen? Neeewwww! Sorry to see that again! Too much parts go into that clasp. What makes no sense to me is this type construction is on the Daytona, YM, GMT2C, President, Milgauss, and DJ. All the current line has these "welded" pieces, and we are not hearing about rampant failures. Are these few incidents flukes, a bad run of clasps, or what? The Gold clasps on a president should be WAY weaker than the SS, but has anyone heard of a failure in Gold. The Dayton clasp has been around how long? Anyone heard of a failure? Like i said earlier, I am "seeing a pattern" - Do you not as well?? Its "GMT" clasp assy's NOT DAYTONAs or DD or anything else that has welded pieces ! Dare I laugh, its a sad thing to see honestly. And trust me , the TRF will shake apart at its "Server Seams" if - "god forbid" - this happens to a certain forumer ! Yes, your are right it has all been GMT's as far as we know from the TRF. My point is many are jumping on the 'Weld" issue, and the GMT is not the only Rolex clasp assembled this way. If you run some searches there is no other noise on the internet about this other than the TRF. for gold clasp, maybe the weld has a strong bonding? or since gold is a "softer" metal than SS, if the welded part is just a hair misalign, the gold material would "give" just enough so that the welding would be stressed enough to break? Could the Genius really be a Dunce? Why, whomever do you mean Randy...? how about dssd is it the same ?? They should have gone for machined. Wow, I have put my GMT IIc through quite a bit...I am going to put the loupe to it tonight and give it a once over. Did you snag it on anything? Bloody hell, mine's a PJ1 - now you've really got me worried!! Mine's PJ5. Hopefully it means that it's not from PJ2 production. We have heard so many failures with this watch and it's not good. First it was the date getting stuck and now these bracelet issues. PJ = 2008 and the no. is the month. So your PJ5 = May 2008 and so on. 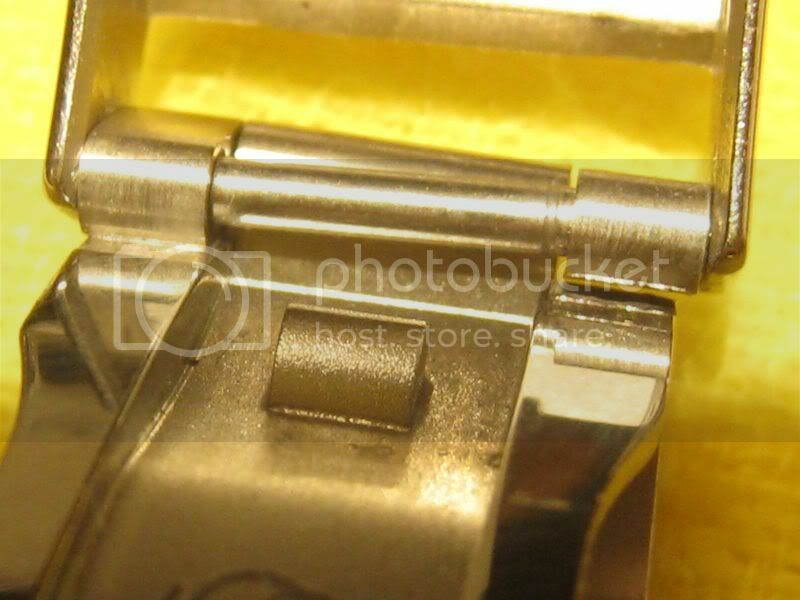 I guess you would have to be very unlucky to have such a clasp failure with Rolex QC. I guess even GENIUSES have their drawbacks!! Perhaps Rolex tried to rush this watch too early?